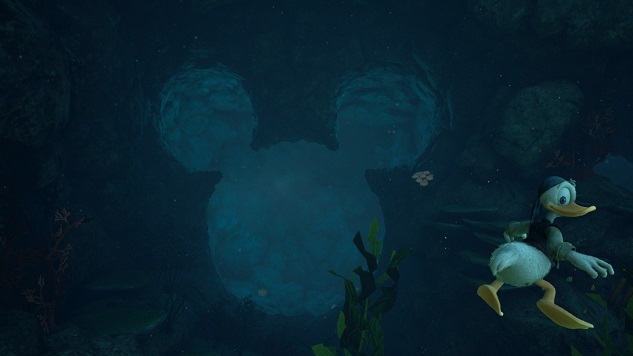 As you travel through the multiple worlds of Kingdom Hearts 3 you’ll encounter a number of hidden secrets scattered across the length and breadth of Disney and Pixar’s brightest creations. Keen-eyed explorers can earn themselves a number of powerful accessories by collecting one of the 90 Lucky Emblems hidden across each of the game’s many worlds. Collecting enough of these emblems will also reward you with a hidden ending clip after you complete the game, so die hard fans will definitely want to get searching as soon as possible. After obtaining the Gummiphone from the starting moments of your time in Twilight Town, you will be able to take photos of one of the 90 total emblems that can take the form of any range of objects and shapes, all of which will come together to display the famous mouse head symbol of the King himself. Some of the emblems are easier to see than others, but with a bit of careful positioning and the help of this handy guide you’ll have gathered them all in no time. 1. On the staircase heading upwards from the Overlook savepoint, located between two pairs of potted trees. 2. Located in The Big Olive area, found on the piece of collapsed wall in the middle point where you slide on Goofy’s shield through the flames. 3. Found on the staircase to the right of the central temple in the Agora zone. 4. Found in the Overlook zone, directly below the rooftop you jump off. The Emblem itself is located on the wall to the right of a column. 5. When the path first splits as you climb up the mountain, take a right and locate the waterfall at the end. Defeat the water monsters nearby and the waterfall will recede revealing the emblem on the wall. 6. Located a short distance up the mountainside, found on the column of an archway just before you enter the cave leading further upwards towards Mt. Olympus. 7. After heading through the cave and climbing past the large statue of Zeus, head towards the clearing and look over the edge of the cliff to find the emblem on a small plateau below. 8. Located in a small cavern towards the peak of the mountain where you fight the earth titan. The emblem can be found hanging on some vines on a dead tree that overlooks a porthole leading over the edge of the cliff. 9. Found in the corridors zone of the realm of the gods, this emblem can be located on the side of the stairs found a little way up from the first water slide you encounter. 10. Found at the top of the first waterslide in the large room, located on the back wall between the braziers in the wall alcoves. 11. Found on the side of the anvil down in the secluded forge area. 12. Found sitting in the distance on the horizon in the Cloud Ridge zone. Take the long upwards grind rail towards the peak of the nearby statue then defeat the monsters at the top before heading over the the edge and snapping the emblem. 1. Right after the cinematic where you get the camera, take a photo of the marker. 2. A small emblem located on the roof of the tram that circles around Twilight Town. 3. Located inside one of the three chimney stalks on the roof of the Moogle shop in the center of the town. 4. Find the hidden open-air theater down the alley on the edge of town and wait for the movie to end before snapping the emblem located on the projector screen. 5. Climb the building opposite the entrance to the theater and look to the area below to find the emblem in the shape of dinner plates set out on a table. 6. Climb the wall next to the hatch leading into the sewers and locate the emblem on the ledge above. 7. As you head from the sewer hatch to the mansion, hug the right edge of the wooded area and you can find the emblem on the side of a large mound of dirt. 8. On the outer wall outside the entrance of the Old Mansion. 9. On the right door of the hatch that exits the forest leading back to Twilight Town.